What Type of Features do Poplar Lakes Homes Have? These homes are either one or two story except for the unique Mercury design. This has a unique multilevel layout and technically has five stories. It has a finished a bonus room, private level owner suite and several integrated rooms throughout the house. The master suite is on its own private level. All of the homes have open floor plans, and optional home office for additional dining room, the option for a loft or fourth bedroom, Wilsonart kitchen countertops, GE appliances, and Moen faucets. These homes have a one-year limited warranty on materials and workmanship, a two year warranty on certain mechanical systems, a five year limited warranty on various types of water infiltration and internal leaks and a 10 year limited warranty on certain structural elements. They also have incorporated homeowners association and protection plan in place. The neighborhood features wooded homesites, cul-de-sac homesites, plentiful green space, three ponds, walking and jogging paths, streetlights and tree-lined streets. Most exteriors feature insulated fiberglass entry door, low-E glass and removable screens, sliding doors, vinyl siding, fiberglass asphalt roof shingles with 25 year warranty, attached two-car garage, concrete driveway with broom finish, landscape package available with mulch beds and fully sided homesites, continuous airflow system on roof with soffits and ridge vents, and low expansion sealant on all exterior penetrations. 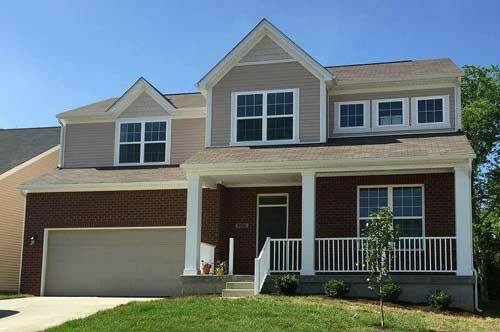 This location is about 20 minutes from downtown Louisville in a small subdivision called Jeffersontown. It's about halfway between the two on ramps to interstate to 65 taking anywhere from 3 to 7 minutes depending on traffic. Downtown Jeffersontown just five minutes away has a Walmart, shops, restaurants, markets, banks and gas stations. This is considered a home rule class city in Jefferson County. It's home to about 27,000 residents. Is considered a major suburb of Lavelle and when Louisville Metro government was established in 2003 Jeffersontown remained an independent city and it is now the Metro areas third largest municipality outside a Louisville. It features its own mayor and city Council. Jeffersontown has a variety of culture, entertainment, medical and shopping options close by. The Black Acre State Nature Preserve is right around the corner as is the Conservancy, Louisville free public library, a 20 movie theater and the Bluegrass Indoor Go Karting. Medical facilities that are close by include the Norton Intermediate Care Center and the Audubon Hospital as well as the Jewish Hospital Medical Center Northeast. Residents have several parks close by as well as a Veterans Memorial Park, Plainview swim and tennis center, dog parks and Kingpin lanes. Shopping includes Kroger, Oxmoor Ctr., Mall St. Matthews and the Jefferson mall. Residents of Poplar Lakes attend the Jefferson County school district and are served by the Farmer Elementary school, which has a 10 out of 10 from great schools.org and is just 1 mile away. Residents are assigned to the Ramsey middle school and the Jeffersontown high school. High school is probably the furthest away at just over 3 miles. If you're just beginning your search throughout the Jeffersontown or Louisville area, take a look at Poplar Lakes. This beautiful community is nestled just off the beaten path yet minutes to shops, restaurants, markets and more. If you're just planning your search, one of the first things to do is to become pre-approved for financing. We'd love to match you with a lender in your area to find out how much home you can afford and provide you with a pre-approval letter. Once you have a good idea of how much home you can afford, we can narrow our search down to homes that meet your search criteria and your affordable price range. Using a buyer's agent is also something we stress. New construction homes and model homes are always monitored by listing agents but for an unbiased approach to home buying, it pays to have your own agent along the way. And remember, it's completely free! Looking for something outside Poplar Lakes? If Poplar Lakes is not the neighborhood for you, there are other subdivisions, communities, gated properties and estates all throughout Louisville and surrounding communities and towns. Please browse the website for specifics on the areas communities or to customize your search for the right home, the right price and the right neighborhood.